Most museums that bear witness to a nightmare, like Yad Vashem in Jerusalem or the Peace Memorial Museum in Hiroshima, are hard to visit. Caught between our need to understand the history and our wish to turn away from the horror, we don’t quite know where or how to look. But Ireland’s Great Hunger Museum, which opened in October in Hamden, is a different kind of place. For one thing, the event it commemorates, the Irish potato famine, happened too long ago for news cameras to capture piled-up corpses and harrowing testimony. It lacks shocking artifacts, like Hiroshima’s charred, stopped pocket watches. And its contemporary accounts, seen through the period gloss of antique typefaces and hand-drawn images, provide safe distance rather than harsh immediacy. 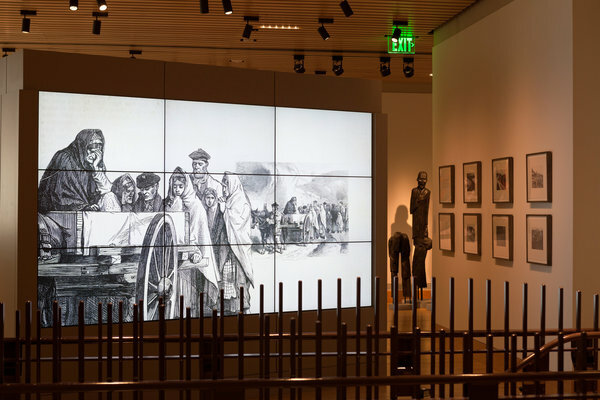 The museum, a project of Quinnipiac University, presents a selection of these prints and periodicals, as well as letters and other documents, responding in real time to Ireland’s starving populace and deserted villages. But in its inaugural exhibition, it lets later artists, both from Ireland and from the countries in which famine victims settled, do most of the talking. This has the surprising effect of simultaneously softening and sharpening the gruesome facts. What the Irish now call An Gorta Mor (the Great Hunger) began in 1845, when a deadly fungus attacked the island’s staple food. In tandem with the government in England, which could have mitigated the disaster but found many excuses to limit its role, the potato blight brought Ireland a growing tragedy of slow starvation, rampant disease and escalating despair that did not abate until 1852, by which time a million or more had died and some two million had fled. It took 150 years after the famine’s worst year, Black ’47, for England to acknowledge some blame for it, and nearly as long for Irish artists to begin grappling with its legacy. So the strongest work in the museum is modern, varying widely in material and ranging in tone from mournful to polemical. Margaret Lyster Chamberlain’s moving bronze, “The Leave-Taking,” is distinctly in the first key, with its 17 bedraggled figures crowding a ship’s gangway that leads to a new life in America — if they survive the voyage. Another striking bronze, John Behan’s “Famine Cart,” is even more blunt: a skeletal horse drags both itself and a wagon loaded with emaciated cadavers to the burial ground. In “An Gorta Mor” Robert Ballagh uses stained glass for a before-and-after triptych, in which a bucolic farm scene and an eviction flank a half-thriving, half-rotting potato plant. If Mr. Ballagh refers to the Catholic Church in his choice of medium, Kieran Tuohy exploits the Irish landscape itself for his sculpture of a “Lonely Widow,” carved in bog oak. The painters also defy categorization. Lilian Lucy Davidson’s haunting “Burying the Child” packs an intense emotional wallop, with the central figure leaning into his shovel almost as if he were still digging potatoes; but it is a straightforward image of loss. Nearby, Hughie O’Donoghue addresses the hard times in an abstract watercolor, “On Our Knees.” And in “Black ’47,” Micheal Farrell takes an allegorical approach, depicting a courtroom in which five Irish skeletons emerge from a coffin to accuse Britain, in the reviled person of Charles E. Trevelyan, who ran the government’s disastrously inadequate relief efforts. “There is scarcely a woman of the peasant class in the west of Ireland whose culinary art exceeds the boiling of a potato,” Trevelyan sniffed in his 1848 book about Britain’s blame-the-victim policies, betraying the contempt with which he viewed the “ignorant and excitable” people he was ostensibly trying to help. This contempt is visible also in the many famine images of apelike Irish peasants in British journals of the day. They are plastered floor to ceiling, along with illustrated newspaper pages from elsewhere, on a circular enclosure that surrounds the viewer and conveys not just specific horrors from the famine years but also the intense public interest in the Irish suffering abroad and the endless, useless wrangling of the political classes. It calls to mind the debates that have been raging here and in Europe since 2008, circling around the same old issues of austerity, socialism and responsibility. Trevelyan thought his harsh remedies would lead to a smarter, happier, more efficient, more responsible future. In the galleries of Ireland’s Great Hunger Museum we come face to face with what really happened. Inaugural Exhibition, Ireland’s Great Hunger Museum (Musaem An Ghorta Mhoir), 3011 Whitney Avenue, Hamden. For additional information: ighm.nfshost.com/ or (203) 582-6500.